This tour only happens when the tides are right. 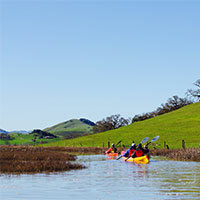 You'll feel like you are entering a whole new world when paddling this hidden gem very close to the town of Petaluma. We explore the narrow sloughs accessible only at certain tide levels and paddle our way through grasses, rushes and reeds where birdlife and waterfowl are abundant. After paddling for 3 hours or so, we’ll then retrace our paddle strokes back through the marsh, to the river and back to our starting point. We provide single or tandem touring style kayaks for our tours. They are appropriate for beginning paddlers. Appropriate clothing required. Bring a lunch and water. To check out Tom Stienstra's article about the Petaluma Marsh in the SF Chronicle - click here. Time: Start time varies according to date (check above) - usual paddling time is 3 hours. From Stan Oberg of Moraga, California on 1/11/2016 . From Peggy of Novato, California on 11/9/2014 . From Anonymous of Menlo Park, California on 11/9/2014 . From richard sievers of petaluma, California on 8/4/2012 . 6/27/2017 – I can't find a date or time for this tour! 10/22/2013 – I am considering this activity when I come to visit my son in a couple weeks. Neither of us are experienced kayakers. Is . . .
9/28/2013 – What is the "level" of this tour - is it for beginners, intermediate or advanced kayakers? What if I have never been in a . . .